The Fiat-Abarth 750 was a tiny sports car manufactured by Abarth beginning in the late 1950s. The famous Zagato “Double Bubble” variant is highly sought after today. Thanks to that car’s success, in late 1960, Abarth shoved a larger engine in their Fiat 600-based car and the Monomille was born. Early Scorpione cars carried bodies by Beccaris and this, a later GT version, sports a fastback body by Sibona & Basano. The engine is a 1.0-liter straight-four that was tuned in the 1990s to 80-ish horsepower (up from the original 60). These cars were expensive when new, costing nearly a third more than a Porsche 356. This pricing model might explain why the Monomille is so rare today. This car, whose restoration was completed three years ago, is one of four GT models that still exist. It should bring between $110,000-$140,000. Click here for more info and here for more from this sale. 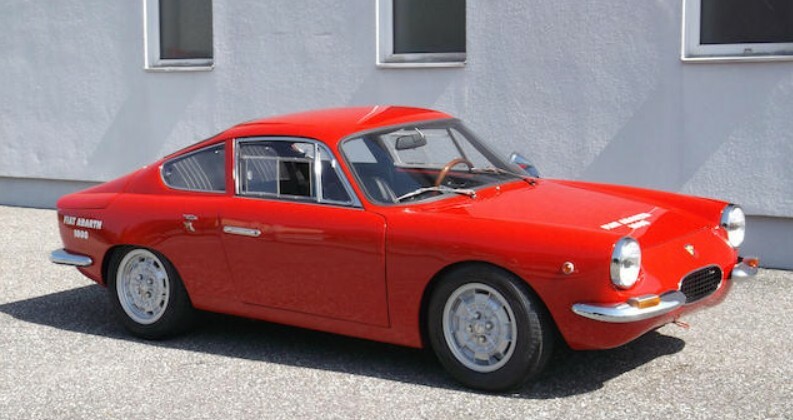 This entry was posted in Uncategorized and tagged 1963, abarth, auctions, Bonhams, cars, classic cars, coupe, fiat, gt, monomille by classiccarweekly. Bookmark the permalink.